From the very childhood Allahdad Khan had enjoyed listening gramophone records on a machine brought by his father from Bombay to Peshawar in the year 1935. He has, since long reserved a portion of his house for the preservation and display of his treasure of gramophone records. He has made Herculean efforts for his very comprehensive collection. The process was between the BEE and the FLOWERS. Above all he is a very generous person. He shares "this honey" with all those who desire or deserve the treatment. This includes doctors and surgeons... Dr. Amjad Hussain from America, Dr. Siraj from Canada, Dr. Zahoor Ahmad Awan and Dr. Ahmad Jamal, nephew of Gul Hamid. Mr. Allahad has a comprehensive album of Gul Hamid, the most charming film hero of thirtees. Mr. Allahdad is always available for entertaining friends and guests and his sons help him in this aspect. The main custodian of the valuable asset is Qaiser Khan, his son. You find here an edge over the traditional hospitality of this province. People come in groups every evening or week ends and for the whole day on holidays. In such a gathering of dedicated people every one feels relaxed and refreshed. Mr. Abdul Aziz a businessman with great affinity to Bengal Music and Mr. Sadullah Jan, Mr. Tariq Latif, Mr. Babar and Mr. Majid Kanwar from Islamabad lovers of Geeta Roy songs are casual visitors. I (a retired engineer) am a regular visitor. All of them have their own selective collection also. Records of different singer are neatly placed in separate boxes - as can be seen in the picture. He uses special covers (with his name) and stickers. 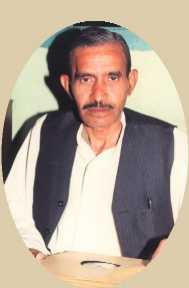 Typical features of his collection is that he has recordings of Dulari Bai and Akbar Khan (sultana fame) of Peshawar and record gifted to him by the composers (Bhishmadeb Chatterji) of Megaphone co. with his signatures. 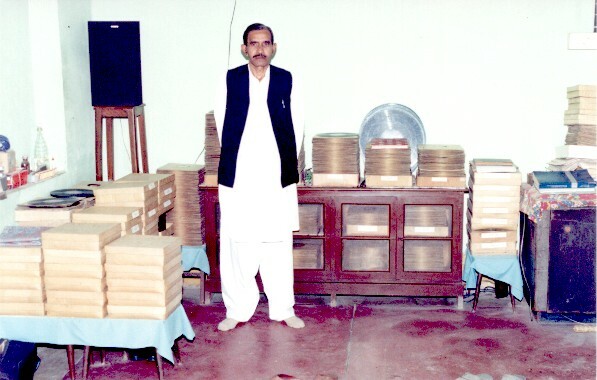 His collection of records covers many languages including Persian, Pushto, Punjabi and Hindko. A rare song of 1920 written and sung by Prof. Miran Bakhsh Peshawari in the court of King Amanullah of Afghanistan is with him. 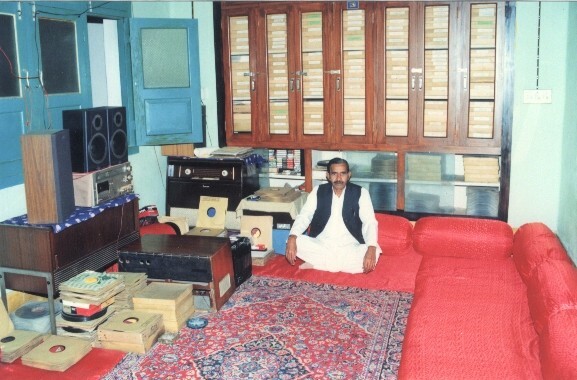 Some of the songs are on about 1000 audio and video cassettes He lives in Yakatoot mohalla of Peshawar. He is like a unique tree with comfort of shadow and abundant of delicious ripe fruit. He is humble and loving gentleman. God bless him with long happy life. - Deep Condolences to the bereaved family members (Suresh S. Chanvankar & Members of the Society of Indian Record Collectors. - Condolence messages from Dhananjey Naniwadekar, Harish Ranguwanshi, Dewan Zubair Farooqui, Har Mandir Singh 'Hamraaz', Sultan Arshad, Sohail Ahmed, Dr. Surjit Singh, Abdul Rasheed Qureshi & others from India, Pakistan and several other countries of the world. * Mr. Allahdad Khan was nominated President of RECAP (Record Collectors Association of Pakistan). May Allah rest his soul in peace - Oldies Club.